The growing threat of antibiotic-resistant staph infections. 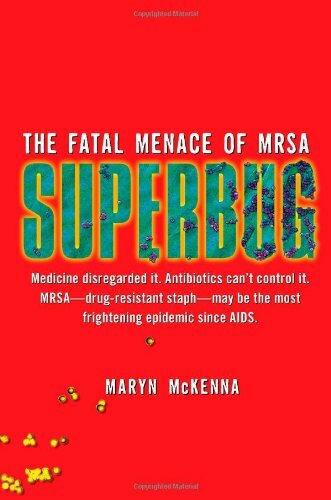 With its ominous title and front-cover description ("Medicine disregarded it … Antibiotics can't control it …"), Maryn McKenna's Superbug is packaged as a bio-thriller. In this literary subgenre, encompassing both fiction (The Andromeda Strain) and nonfiction (The Hot Zone, as well as the book under review), the security and predictability of modern civilization are suddenly shattered by the outbreak of an enigmatic infectious disease. We see the terrible truth that our way of life is fragile and tenuous, subject to wild, dark forces. The stories' heroes—usually doctors and scientists—strive to make sense of the plague and turn back the tide of entropy. At the end of these tales, when order has been restored, we feel a rush from our brush with danger and relief that the chaos has been calmed. But instead of providing the consolation of a happy ending, Superbug warns that the worst is yet to come. The book's subject, a bacterium named staphylococcus (staph) aureus, has probably been with humans as long as we have existed. While it often lives innocuously on our skin, staph can cause infections when it enters our bodies through means such as a cut or inhalation. The release of the first antibiotic, penicillin, in 1944, inaugurated an era of effective treatment for previously fatal bacterial maladies such as staph. With the 20th century witnessing its second world war, this miracle cure buoyed the beleaguered myth of progress. A May 1944 cover of Time featured a portrait of penicillin's discoverer, Sir Alexander Fleming, and declared "His penicillin will save more lives than war can spend." But soon after penicillin came into use, strains of staph resistant to the antibiotic began to appear. A June 16, 1953 article in the New York Times entitled "Antibiotic Effect Feared on Decline" reflected scientists' growing concern. In 1960, after years of intensive research, a promising new antibiotic named methicillin was introduced in the United States. Pharmaceutical chemists had specially designed it to foil staph's mechanism for resisting penicillin. The creators of this breakthrough germ-killer were confident that if resistance to it were to occur at all, it would be far in the future. So it came as a rotten surprise when a 1961 issue of the British Medical Journal reported three cases of staph infections unresponsive to methicillin. Thereafter, all strains of staph resistant to methicillin and its antibiotic descendants were termed methicillin-resistant staph aureus (MRSA). Superbug describes how in the decades since its first appearance, MRSA has become a worsening problem in hospitals around the world. Catheters and surgical incisions provide the bacterium with ports of entry. Once inside the frail, sick bodies of hospitalized patients, MRSA grows with little resistance. Gathering ill individuals together, hospitals act as Petri dishes, with workers often unwittingly spreading the bug from patient to patient. For instance, a 1980 MRSA outbreak in a Seattle hospital that killed 17 patients and sickened many more was ultimately traced to one nurse who was colonized with the bacterium in her ears, nose, armpits, and groin. The menace of hospital-acquired MRSA is part of a larger, important story in American medicine that has largely been ignored in the ongoing health care debate. In 1999, the Institute of Medicine's landmark study To Err is Human concluded that from 44,000 to 98,000 people die each year as a result of preventable medical errors—the equivalent of a 747 plane crashing every other day. The transmission of infections such MRSA to hospitalized patients was cited as one of the chief causes of this avertable loss of life. Superbug reports that in 1990s, a new strain of MRSA appeared. The pathogen had hitherto been exclusively a hospital phenomenon. But just over a decade ago, an emerging version of MRSA began attacking previously healthy people who had not been recently hospitalized. The book tells the tragic tales of individuals with innocent-appearing respiratory or skin infections who overnight became deathly ill from what was later discovered to be MRSA. In one awful story, a young couple in the Hyde Park area of Chicago took their 17-month-old son to the emergency room (ER) because of a fever. Shortly after they arrived home from the ER with some antibiotics and reassurance that the boy would be well, his lips became blue and his breathing labored. By the time they returned to the hospital, their toddler's lungs had been destroyed by pneumonia and he shortly thereafter died of septic shock. What at first appeared to be a simple infection that would respond to first-line antibiotics turned out to be MRSA.